Digital games retailer Green Man Gaming plans to float on the London Stock Exchange with a reported valuation of £100 million. It would be the fourth UK games business to IPO in 12 months, following similar moves from Sumo Digital, Team17 and Codemasters since December last year. "I stand on the shoulders of giants," Green Man Gaming CEO Paul Sulyok tells GamesIndustry.biz. "I've had tremendous support from other people in the industry who have gone through this journey already. "I am not having to go through the education process that people like Andrew Day [Keywords] and Carl Cavers [Sumo] had to go through for their businesses when they went to market. And secondly, I am coming out on the back of great IPOs that Frank Sagnier did at Codemasters and Debbie [Bestwick] did at Team17. It has always been our plan to come to market, it is just that other people's plans came to fruition before we had the chance to come to market." He continues: "Great Britain is great at making games, it's great with technology and with making stuff. These two almost diametrically opposed skillsets we have in abundance here. If we can then access the capital markets to be able to drive growth on a global basis, I think this is a very strong position for the UK games industry to be in. All credit to the vanguards of this... the Debbie Bestwicks, the Andrew Days and the Carl Cavers, who took those first steps into the capital markets and made a success of it. Look at their share prices and the reputations they've built up." Sulyok boasts that Green Man Gaming has grown roughly 25 to 30% ever year since its inception, going from a turnover of £16.2 million in 2014 to £47.5 million last year. The firm expects that 25% growth rate to continue in the coming years, too. Despite this, it is still not a profitable business, and it anticipates an EBITDA margin of 3% in the medium term. "Green Man Gaming is a growth company," Sulyok explains. "You can go to market with a significant EBITDA, or as a growth company. We've clearly chosen the route of being a growth company. We have grown this company from a topline perspective from between 25 and 30% year on year. That's who we are, that's what we do. We are not a big margin company, and the margin that we do make, we reinvest in the company. We also raised relatively little money for a company of our size [£6.7 million the company states]. So what we've effectively done is that as we've grown our topline, we've reinvested in-order to fuel additional growth for our future, both from a technical perspective and from a market reach perspective." In its intention to float release, Green Man Gaming says it sells more than 6,600 digital games, has a relationship with 677 publishers and now has 4.7 million registered users (of which 1 million are active customers). Sulyok states that Green Man Gaming will invest the proceedings from its IPO in three key areas - it will spend the funds on performance and brand marketing, expanding into other international markets and finally through acquisitions. "we will also be looking for other companies that will bring something to the Green Man Gaming ecosystem. That could be technology, it could be content, it could be market reach"
"We aim to internationalise ourselves properly," Sulyok states. "We aim to expand into markets where we don't currently have all the payment systems, or language or local operational and customer support. And then we will double down and market into those regions from some of the primary proceeds that we are raising. "And then obviously, we firmly believe in this market and our strategy, and we will also be looking for other companies that will bring something to the Green Man Gaming ecosystem. That could be technology, it could be content, it could be market reach... and then we'll be looking to bring them into the fold from an M&A perspective." Most of this is specific around Green Man Gaming's digital retail business. So what does that mean for Green Man Gaming's fledgling publishing division? "Right now, the publishing division is the smallest part of our business," Sulyok admits. "But it is also part of the business that I feel very passionately about, and I know a number of the team does, too. Come the IPO, there will be an allocation of primary proceeds that is going to go towards growing the publishing business. Ultimately the games industry, in my view, is in two parts: it is about customers and content. If you can fulfil both, then that's a huge opportunity." Nevertheless, digital retail remains the focus for Sulyok and his team. 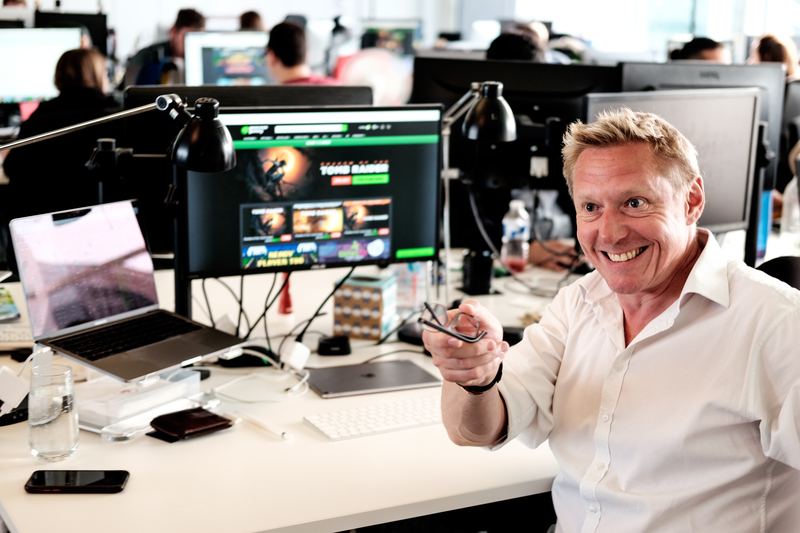 Green Man Gaming sells digital game keys that are used on numerous competitive retail platforms, including Steam and Ubisoft's UPlay. It also sells games for Nintendo Switch and PlayStation 4. Even so, the firm estimates that it has less than 1% of global digital gamer accounts, and this will be partially due to the dominance of certain digital stores (Steam in particular). Sulyok believes this shows the level of growth opportunity that Green Man Gaming has, but it also highlights just how strong its competition is. "Now there are months where only a fraction of the games that are being sold are on Steam." "There is a transition taking place, with the world moving away from physical retail and into a global digital network," Sulyok says. "That allows somebody who has a solid technical platform, with the ability to sell games in 16 different currencies in the way we do, in multiple languages, with 80-odd different payment systems, all around the world simultaneously. That platform, combined with the decline in physical retail, gives you a real opportunity. "When you combine it with the fragmentation that we see right now in the marketplace... every week, almost, there's another platform being rolled out. Every single week another publisher deciding to roll out games on their own platform, instead of Steam. "Back in 2010 when we first started selling third-party DRM games on Green Man Gaming, 90% of the games were on Steam. Now there are months where only a fraction of the games that are being sold are on Steam. You are seeing big titles like all of the EA games, all of the Ubisoft games, being sold via different platforms. Some of the biggest forecast games coming in the fourth quarter are going to not be on Steam. There's a fragmentation taking place. One of the biggest games of 2017 wasn't on Steam. "Fragmentation, combined with our global reach, with the shift from physical to digital, gives great opportunity." Compared with some of the other UK companies that have floated in recent months, Green Man Gaming is a relative newcomer. It was officially formed in 2009 and didn't go live until May 2010. "I remember nine years ago, in a small little office, myself and [founding director] David Clark briefing you and [former MCV editor] Michael French about this little company that wanted to buy and sell digital computer games," Sulyok concludes. "Now, wind the clock forward nine years, we have a successful company that has 100 people engaged with it right now. We have customers in 195 countries around the world. We sell in four different languages. And we are selling millions of games a year. It's a good little business. "We have a great team of people working in this office. We have made very sure that over the years that people who have joined have a bit of the company. So there will hopefully be a number of people smiling if this goes well. We have an amazing customer base, brilliant business partners and a great team driving things forward."